This particular Saturday, we saved PetCo for the last stop. Well, we were headed out the door and all of sudden I heard Alex ask me if she could go pet the dog before we went home. Indy was looking at my daughter with so much love and she was returning the “look”. I knew I was sunk. I went home and told my husband about the strange looking puppy. 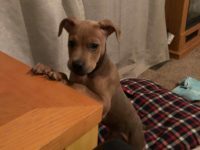 He wanted to learn more about this puppy so we went to the Midwest Rescue web site and read all about Indy. We submitted our application that day. Pam did a home visit and two days later Indy came to visit and has found his forever home. Indy has worked his magic with the whole family. Ricky loves to take charge of Indy’s house training. He loves to take Indy in the yard, bring him in and give him his treat for a job well done. Indy gives Ricky the gift of high self-esteem. We also see Ricky’s speech improve. Ricky enjoys telling Indy to sit, stay, down, leave it, good job, and good boy and feels so proud when Indy responds. Alexandra loves to take Indy in the yard to play. She also loves to share special time with Indy. The two of them spend hours in her room bonding. Alex and Tiffy share a room and bunk beds. Indy lies in the bottom bunk while Alex tells him all about her day and all her special thoughts. Indy gives Alex the gift of friendship. Tiffany, our youngest is our most involved child. She has Down Syndrome, Autism, is Hearing Impaired and physically and medically challenged. Tiffany and Indy have a special bond. Indy loves to sit by Tiffany and give kisses. Tiffy laughs her little head off. Of course, Indy also knows to sit by Tiffy when she is eating. Indy gets many treats this way. We think Indy knows that Tiffy is more involved so he is gentler with her. Indy does draw the line on letting Tiffy touch his toys. Indy gives Tiffy the gift of love, joy and kindness. Indy’s gift to Rick and me; happiness, joy, and sheer delight. Indy worked his magic on Grandma and Papa too. What an amazing trip to PetCo. Starting out life as an unwanted puppy, this happy boy found his place with us!